We suggest that surgical extirpation of primary breast cancer among other effects accelerates relapse for some premenopausal node-positive patients. These accelerated relapses occur within 10 months of surgery for untreated patients. The mechanism proposed is a stimulation of angiogenesis for distant dormant micrometastases. This has been suggested as one of the mechanisms to explain the mammography paradox for women aged 40–49 years. We could imagine that it also plays a role in adjuvant chemotherapy effectiveness since, perhaps not coincidentally, this is most beneficial for premenopausal node-positive patients. We speculate that there is a burst of angiogenesis of distant dormant micrometastases after surgery in approximately 20% of premenopausal node-positive patients. We also speculate that this synchronizes them into a temporal highly chemosensitive state and is the underlying reason why adjuvant chemotherapy works particularly well for that patient category. Furthermore, this may explain why cancer in younger patients is more often 'aggressive'. Stimulation of dormant micrometastases by primary tumor removal is known to occur in animal models. However, we need to determine whether it happens in breast cancer. Transient circulating levels of angioactive molecules and serial high-resolution imaging studies of focal angiogenesis might help. Short-course cytotoxic chemotherapy after surgery has probably reached its zenith, and other strategies, perhaps antiangiogenic methods, are needed to successfully treat more patients. In addition, the hypothesis predicts that early detection, which is designed to find more patients without involved lymph nodes, may not be a synergistic strategy with adjuvant chemotherapy, which works best with positive lymph node patients. We have previously suggested that the surgical extirpation of primary breast cancer accelerates relapse . Baum and colleagues have made similar suggestions . There are two mechanisms that we have proposed: one is angiogenic and the other is proliferative. Perhaps each also includes a component of the other. The angiogenic surge is due either to the removal of inhibitors or to the appearance of stimulators or growth factors in response to surgical wounding [3, 4]. This activation causes temporarily dormant distant micrometastases to vascularize, and thus to enter a rapid growth phase. Data suggest that such stimulated angiogenesis may occur in about 20% of premenopausal patients with node-positive disease. This is more frequent than in other groups; the frequency is 5:1 for node-positive patients compared with node-negative patients, and the frequency is 2:1 for premenopausal patients compared with postmenopausal patients. It is therefore mainly peculiar to premenopausal node-positive patients. We have suggested that this phenomenology can be important to explain the breast cancer screening controversy for women aged 40–49 years [5–7]. The proliferative mechanism for early relapse, which is also the result of surgery, is stimulated division of single dormant cells  or even changes in the dynamics maintaining the steady state of dormant or indolent micrometastases, eventually resulting in angiogenesis and growth. For small primary breast tumors less than 2 cm, 50% of all relapses are in this first wave of relapses. For larger tumors, 75–83% of relapses are in that category. The early relapses among patients receiving no adjuvant treatment due to stimulated angiogenesis occur in the first 10 months after surgery, while the adverse events stimulated by proliferative changes occur in the first 4 years after surgery with a peak at 18 months. There is thus overlap between these two distributions of outcome variance. Together, these distributions constitute an early peak in relapses that happens sooner than would otherwise occur due to a stimulation of growth from surgery. We wondered what effect adjuvant chemotherapy had on these early relapse events. In particular, one could imagine that chemotherapy would attenuate surgery-stimulated tumor cell proliferation and tumor growth. Since this surgery-stimulated growth is strongest just after operation, when adjuvant chemotherapy is traditionally used, a high level of cytotoxic activity on these rapidly proliferating cells would be expected. We hypothesized that there should be some clear clinical evidence demonstrating an intimate tie between surgery-stimulated tumor growth and adjuvant chemotherapy. We analyzed the frequency and timing of post-resection relapse in comparable populations that did receive and did not receive adjuvant chemotherapy, focusing upon the time structure of early recurrence during the first 4 years after resection. Figure 1 shows the hazard of relapse for untreated patients and for patients treated with Bonadonna cyclophosphamide, methotrexate and fluorouracil chemotherapy . The reduction in relapse hazard with cyclophosphamide, methotrexate and fluorouracil therapy for premenopausal node-positive patients is approximately 80% at 6 months, 50% at 1.5 years and 10–20% at 4–7 years. The advantage of cyclophosphamide, methotrexate and fluorouracil chemotherapy is seen to be most pronounced in either delaying relapses or curing patients who would have relapsed in the first year or so. 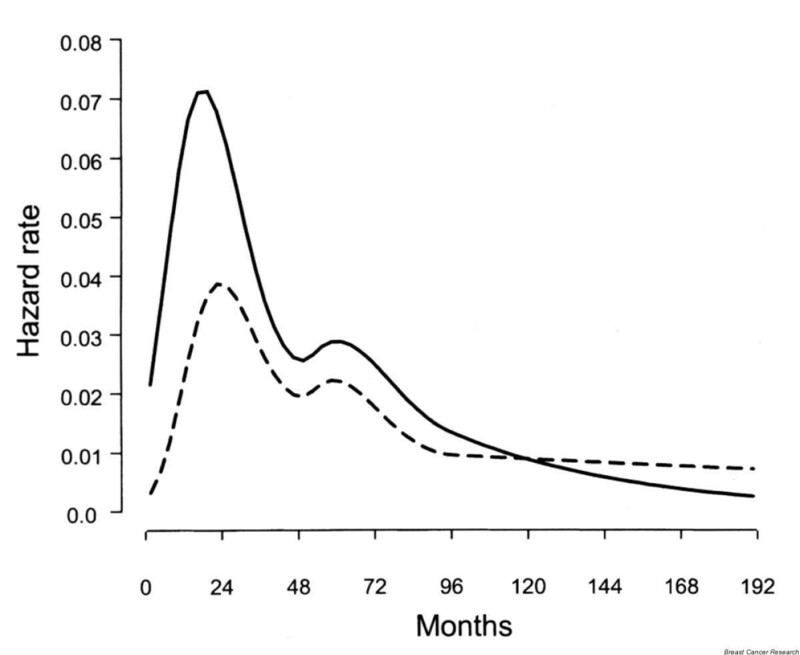 Hazard rate for treatment failure for axillary node-positive patients undergoing mastectomy alone (continuous line), or followed by adjuvant chemotherapy according to the cyclophosphamide, methotrexate and fluorouracil original scheme for 6–12 months (dashed line). Curves are based on a logistic model . Following early trials, chemotherapy clinical consensus reports from the years shortly after the introduction of adjuvant chemotherapy for breast cancer (1980 and 1985 National Institutes of Health Consensus Development Conferences) recommended using adjuvant chemotherapy for premenopausal node-positive patients . Only in later years, after careful analysis of much larger trials with longer follow-up, was it determined that adjuvant chemotherapy is of some value in subsets of node-negative disease, or in any patient with positive nodes. Comparing this historical development of adjuvant chemotherapy use with our model, we wondered whether there might be a connection between induced angiogenesis at surgery and adjuvant chemotherapy, since they are each closely linked to early relapses of premenopausal node-positive patients. We speculate that we have identified the underlying reason why adjuvant chemotherapy was initially indicated only for premenopausal node-positive breast cancer patients. Removal of the primary tumor stimulates angiogenesis in distant dormant micrometastases in a substantial fraction of patients in that subgroup. This surgery-induced activation results in a release from dormancy and in a rapid growth of micrometastases and corresponding high chemosensitivity just at the time when adjuvant chemotherapy was empirically determined to be most effective. This also may be why breast cancer in young women is called 'aggressive'. Indeed, the term is well fitting for the 20% of premenopausal node-positive patients that relapse within 1 year of surgery. Our hypothesis for breast cancer is supported by what happens in the Lewis lung animal model , in which 100% of mice injected with this tumor develop many lung micrometastases that do not vascularize and grow while the primary tumor is intact. After the primary tumor is resected, the angiogenic switch is thrown and the lung metastases start to grow rapidly. Our analysis suggests this also happens in breast cancer, but only in one or two micrometastases per patient in 5–6% of all premenopausal patients (or in 20% of all premenopausal node-positive patients). Testing whether this happens in breast cancer will be relatively difficult because of the fewer events and clinical limitations. Circulating levels of known angioactive molecules (both stimulators and inhibitors) could be measured before and after surgery to look for indirect signs of the hypothesized phenomenon. Direct observation of angiogenesis switch-on is much more difficult, and specific advances of high-resolution functional imaging methodology, aimed to study focal angiogenesis within major sites of recurrence, are needed. There are two major implications. First, the early use of adjuvant chemotherapy in 1975 cured approximately an additional 11% of premenopausal node-positive patients (20-year disease-free survival was 37% for treated patients and was 26% for untreated patients) . Over the years since then some improvements have been made, but not dramatically so, and it may be said that results of adjuvant chemotherapy have plateaued . Our hypothesis would suggest that it would be difficult to cure more than 20% of premenopausal node-positive patients with short-course and intensive chemotherapy after surgery. To cure more patients, other strategies would be needed to take advantage of the complex tumor kinetics including host interactions. The second implication is that early detection, which is designed to find more node-negative patients, may not be a strategy for which adjuvant chemotherapy can add much to outcome, since it works best with node-positive patients. This may explain the disappointing lack of benefit reported from early detection of breast cancer by the Canadian Screening study in which all premenopausal node-positive patients received adjuvant chemotherapy . Other than patients that are premenopausal and node-positive, patients who are diagnosed with estrogen receptor-negative cancers are also highly responsive to adjuvant chemotherapy. Unfortunately the Milan data [1, 6, 9, 13] did not contain receptor values for individual patients, so understanding any possible relation between our hypothesis and hormone receptors must await further developments. There is apparently a complex interaction among screening, surgery, adjuvant therapy, angiogenesis, tumor cell proliferation, nodal status and menopausal status that needs to be better understood for further enhancing breast cancer care. These effects seem to be more pronounced, and thus particularly important, for younger women.